The Maestro Is No More! The greatest music composer of them all has passed away! Here are some of the heart-felt tributes paid by his admirers. Please send your tributes to nimishp at hotmail dot com. On Saturday night I was watching "The Pianist" and Anil Biswas's Paino based songs were racing through my mind. I had no clue that Anilda had passed away. Even if I had watched the movie at a different time, I would have been reminded of Anilda because for me Piano is synonymous with his music. For that matter many things in my life are synonymous with Anilda's songs. It all began 15 years ago. That was when I had first heard "raahi matwaale"(Waris). Since that day, whenever there is fragrance in the air, I start humming the song with "bhiinii bhiinii kushbuu se man huaa chanchal". Along with "raahi matwaale". I discovered songs from Tarana and a small step into the world of Anilda had begun. It was only a few years later that the journey picked momentum thanks to a programme on Vividh Bharati (IIRC it was called Sangeet Sarita) where Anilda & Meena Kappor were interviewed by Tushar Bhatia.Immediately I got hooked to "rasiya re man basiya re" and flute was never the same before. Yaad rakhna chand taaro exposed me to a new hue of Lata's voice. While "kaahe kar der baraati" was the first song in Dada's voice that I heard, the one that had maximum impact was Gagari sookhi(Aurat). For a long time "paani de paani de" from that song were the first words I used to utter after waking up from sleep. The pause in "seene men sulagte hain armaaN", the sound of flame being extingushed after "taare duube shama bujhi" in "dam bhar ka thaa daur kushi kaa" (Maan) are just two instances that speak volumes about the oodles of creativity Anilda possessed. The only way I can conceive the fact that Anilda left us is by humming "dekh dharatii se aakaash hai kitanii duur" (from "aa muhabbat ki bastii basaaenge ham":Fareb)with the right amount of emphasis on "duur". May his soul rest in peace. It wasn't a coincidence that I saw "The Pianist" on that fateful day. It was divine intervention. 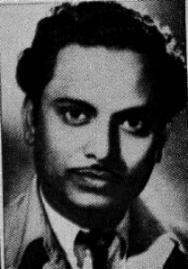 Anil Biswas symbolizes the closest to perfection in film music. Never before or since has there been a composer to even approach the consistency with which he composed one precious song after another. Almost every song of his carries the stamp of a genius. His orchestration was subtle without ever being obtrusive. The compositions appear to come straight from the heart and pierce the listeners'. The plaintive melody of a "Papiha re" is typical of Anilda - the pathos is brought out so beautifully. Then the same raga could be made into such a chirpy number as "Suhani belliya". This is just sheer genius. The brilliant usage of instruments is another hallmark of Anilda's music. The piano especially comes to life in his music. "Ae jaan-e-jigar", "Man me kisi ki preet basa le", "Tumhare bulane ko ji chahta hai" - just some of the examples of songs whose usage of the piano leave you awe-struck. It is now more than a decade since I first discovered the magic of Anilda's music. And over the years, his music has only grown on me. It is perhaps safe to assume that we would not be seeing the equal of him in a great hurry. I don't remember exactly when my Journey with this great Mastroe called Anil Vishwas, started whom I consider as Doyen of HFM. It was when I was child & a family friend Mr. Talekar used to invite my parents for listening session. He had entire collection of Anilda on his spools. I used to accompany my parents. That was the time when I first went thru Kismet, Anokha Pyaar, Tarana, Laadli, Jwar Bhata, Aaram etc. Rahi Matwale(waris),Yaad rakhna chand taro(Anokha Pyar),Seene mein sulgate hain arama(Taraana), Man mein kisiki preet basale(Aaram),Kaisen kahu Bajariya(Laadli),Nain mile nain(Taraana),dil jalta hai(Pehli Nazar) made ever-lasting impact on me. For me Anilda is a composer par excellence & all future generation composers are indebted to him for introducing Melody & many instruments like Piano to HFM. Melody was the hallmark of Anilda which was seldom repeated by any composer. Unfortunate in the sense,seldom got his due as well as had to see the demise of his many years juniors. "The true work of music lies in its ability to make life divine & hence worth living." The saying aptly applies to Anilda's sublime music. He was really the BRAHMA of HFM --- the God of creation. He took the HFM to such dizzy heights that one may eternally float in his musical domain. The power & delicacy of his music are beyond expressions. He enriched the taste & understanding of generations of music-lovers. Melody was Queen of his music. May God grant his soul the choicest place in Heaven! "Jhaale bahu, hotil bahu, parantu ya sam ha"
Anil Biswas defines Hindi Film Music for me. Ever since I started appreciating his compositions my musical tastes were never the same again. I am eternally indebted to him for raising the film music to ethereal realms. While I know for sure that his music will continue to stir the souls for generations to come, it is still hard to get over the shock of the bad news. Continuous listening to his numerous exemplary compositions has helped only partially. For me, Anil Biswas was the 'Pioneer' in every sense of the term. He has been appositely called the 'Bhishma Pitamaha' of Hindi Film music. He gifted us with the concept of orchestration, singers like Talat and Mukesh, and also Lata (he moulded her singing style). Songs like 'aye dil mujhe aisi','mohabbat turk ki maine','seene me sulagte hai armaan','pi bin sunaa ji','rasiya re man basiya re','dheere dheere dhal re chanda','sanjh ki bela','bhai hum pardesi log','beimaan tore nainwaan','na dir deem','man me kisi ki preet basa le','ja main tose nahi bolun' and many others will forever enthrall me. Indeed, my wanderings in the world of old Hindi film music acquired a compeletely new meaning once I discovered Anil Biswas. Obituary published in New York Times. Recommended screen size 1280 X 1024. Last modified July 4, 2003.